The Monkey Bible, a novel by Mark Laxer, is the story of Emmanuel, a deeply religious young man who suddenly has reason to suspect that his genetic make-up, and indeed the story of his creation, is not what he had thought it had been. Dismayed and seemingly alienated from his Church, Emmanuel journeys across America, to England, and through Africa and Asia in search of his genetic and spiritual origins, identity, and community. 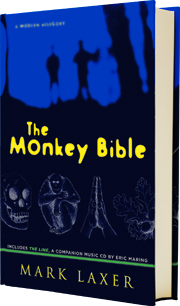 The Monkey Bible is the story of Lucy, a young woman from Seattle with a love of science who guides Emmanuel on his quest and, as a gift for her confused friend, rewrites Genesis from a non-hierarchical, biologically inclusive point of view. The Monkey Bible is the story of Evelyn, a young woman from Washington DC, whose faith in Emmanuel and in the Roman Catholic Church remains rock-solid throughout his - and her - soul-searching ventures into the realm of evolution and the natural world. The science behind this work of fiction is accurate, up-to-date, and accessible, and the reader comes to understand evolution and life science fundamentals - the biological creation story - as the adventure unfolds. 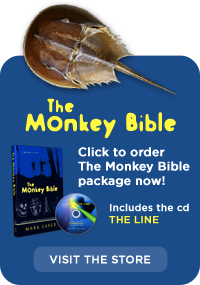 While The Monkey Bible can be seen as the latest chapter in the larger-than-life debate between Darwinists and creationists, the novel is respectful of both sides, and strives to provide a gentle supportive bridge across which people who disagree can communicate. Ultimately, the novel is an exploration of the line - both scientific and mythological - which separates humans from non-human animals. It is an exploration of the line which separates science from religion. It is an exploration of the need in humans for creation myths, constructive or otherwise, and for storytelling. It is an exploration of what it means to be human and an exploration of the hierarchical nature of our social structures. It is a timely and necessary plea to slightly alter the stories by which humans define themselves as a way to protect life, and in particular the human species, from extinction.